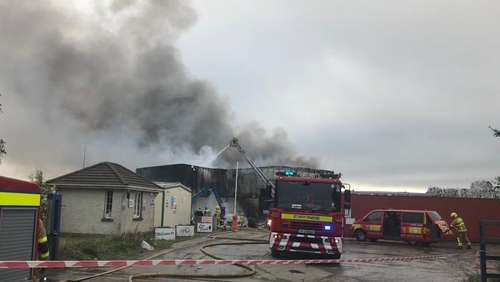 Dublin Fire Brigade has said a blaze that broke out at a recycling centre in Rathcoole in Co Dublin last night will continue to burn for a number of days. At the height of the blaze, nine units of Dublin Fire Brigade were battling to extinguish the fire at the premises on Tay Lane. The fire brigade said large amounts of recycling material had caught fire, but it is not known yet how the fire started. Nobody was in the plant when the blaze broke out and no one was injured. The building has been extensively damaged but the estimated cost of that is not yet known. Dublin Fire Service has warned motorists on the N7 not to get distracted by the blaze. It has asked nearby residents to close their windows as a precaution to protect themselves against smoke. Firefighters say the blaze is now under control but they say it may take a number of days to completely douse the fire.